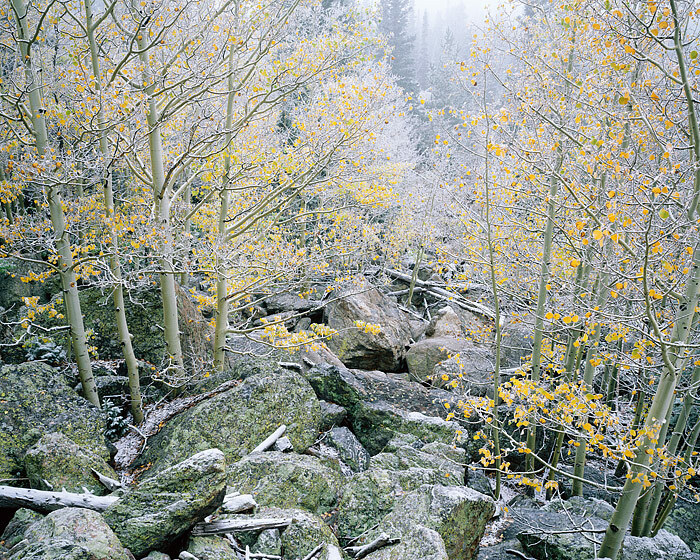 Light snow, Hoar Frost, and Rime Ice coats this fall Aspen Grove near Bear Lake. Although Aspens are not as plentiful in Rocky Mountain National Park as they are in other parts of Colorado, the Bear Lake area has a fair density of the iconic tree. Aspens are more commonly found in this area due to a fire that occured in the 1920's which burned much of the pine forest around Bear Lake. Aspen trees often revegitate areas where fire or slides have occured. Bear Lake is a popular destination because it is so close to the town of Estes Park. Photo © copyright by Thomas Mangan.